Preface. Structure and function of G protein coupled receptors, T. Jackson. Structure and function of G proteins, J. Olate & J. E. Allende. The regulation of adenylyl cyclase by receptor-operated G proteins, A. Levitzki & A. Bar-Sinai. Receptor regulation of phosphoinositidase C, T. F. J. Martin. Guanylyl cyclase-linked receptors, D. L. Garbers. Prostaglandin and thromboxane biosynthesis, W. L. Smith et al. Cyclic nucleotide-dependent protein kinases, J. D. Scott. Protein kinase C, S. Stabel & P. J. Parker. Structure and function of inositol trisphosphate receptors, C. W. Taylor & A. Richardson. Receptor-regulated calcium entry, J. W. Putney, Jr. Regulatory functions of calmodulin, A. R. Meens et al. Cyclic nucleotide phosphodiesterases: pharmacology, biochemistry and function, W. J. Thompson. Regulation of the metabolism of 1,2 -diacylglycerols and inositol phosphates that respond to receptor activation, S. B. Shears. Ca2+ extrusion across plasma membrane and Ca2+ uptake by intracellular stores, L. Missiaen et al. Organization of intracellular calcium signals generated by inositol lipid-dependent hormones, T. A. Rooney & A. P. Thomas. Calcium signalling and the triggering of secretion in adrenal chromaffin cells, T. R. Cheek. Intracellular messengers and the control of protein synthesis, S. J. Morley & G. Thomas. Acknowledgements. References. Index. This important new reference work offers an outstanding collection of articles devoted to the discussion of "intracellular messengers". Extracellular stimuli ("first messengers") bind to receptors on the plasma membrane of cells to trigger changes in the concentration of intracellular messengers ("second messengers") which leads, in turn, to changes in cellular activity. However, the intracellular activities of so called "third messengers" may also be involved complicating the concept of a rigid sequence of events between receptor and response. 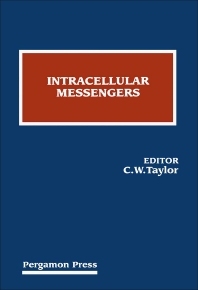 The preference for the term "intracellular messengers", and, hence, the title of this volume, recognizes that a complex web of interactions between intercellular messengers determines the concentrations and ultimate effects of each. For researchers in pharmacology, biochemistry, cellular biology and cellular signalling.